Anping Time Metal Wire Mesh Products Co.,Ltd. 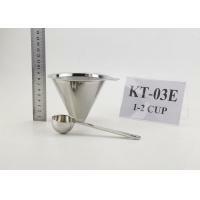 Coffee dripper, is made of high quality 18/8 (304) stainless steel, unlike the paper filter, it is reusable. 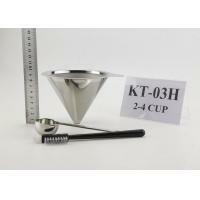 The coffee dripper is designed in double layer mesh, which keeps the coffee grounds in the coffee filters while allowing all the coffee nutrients and flavored oils pass through for a better tasting cup of coffee. 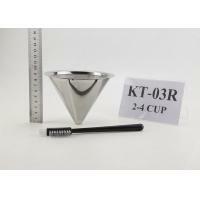 • PERFECT FIT – the base of this beautiful stainless steel coffee cone dripper filter fits on most cups mugs and thermoses making it your best pour over coffee method. 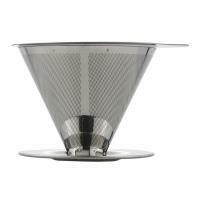 • EASY CLEAN - Clean water can be enough for cleaning the coffee dripper after you finish your brewing. 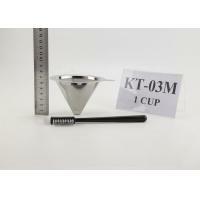 • COMPLTETE FILTRATION,NO DREGS - this coffee dripper is combined by 18/8 stainless steel precision filter, it can filter 99.99% of the coffee dregs,you will get a cup of more delicious coffee. • Place the coffee dripper on the top of the mug. 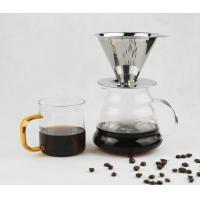 • Fill the coffee dripper with proper coffee. • Pour in hot water slowly. • Remove the coffee dripper from the mug. • Enjoy the delicious coffee. 60 units/carton, carton size: 53*41*56cm. Time company, which is working on stainless steel coffee dripper area since 2015. This union is made by a group of ambitious and sunny youth, determines to turn the coffee dripper field into a new style, we carefully design each of our products and use the highest quality of mesh in the whole country to produce coffee tools. But our coffee enthusiastic designers are developing, and testing many more products and designs that we look forward to delivering to the coffee consumer in the coming years. 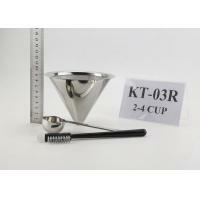 We are excited to continue bringing beautiful, quality coffee brewers.